I love this time of year. Spooky stuff on the television (who's watching Dead Set on E4?) and pumpkins and silly things like LiveJournal renaming itself UndeadJournal just for the holidays. I'm organising a party tonight for seven year olds, with skeleton straws and cocktail sausages on bat sticks and tomato ketchup with a new label "Blood". Costumes have been bought, and party bags with spider pens and monster bookmarks. Let the celebrations begin! Just a little thing but it came at a crucial moment, as I'm about to send the revised novel to the agent, suffering from the usual anxieties that accompany this stage of the process. Anyway, an email this morning from the editor of The Sigurd Journal, saying, "I wondered if we could discuss reprinting Revenge of the River Gods in our journal. I thought it was by far the best thing Every Day Fiction has published this year. I wanted to find out if you... are amenable to considering letting us reprint this story in both our print and email versions of the journal." As I say, nice timing. I shall consider it a good omen. I love it when a crime writer preaches the gospel of character over plot. It give me a warm fuzzy feeling (of hope, that I can hack it in this genre). Thanks to Frances for pointing me towards this interview with James Sallis, who is now on my list of To Read crime novelists. "The barely-there storylines in Salt River almost evaporate on the page. You don't get lost in his plots, they tend to lose themselves. "Plots are a contrivance – our lives are plotless – yet they're necessary, I think, to literary form," explains Sallis. "My way of dealing with this has been to move the plot offstage a bit, to write around it." Is this why, when I think of Sallis's books, I'm hit by smells of home-brewed coffee and wild magnolia rather than anything that actually happened? "Those are the parts of the world that we own, what comes back to us about times in our own lives when we think of the past," he insists. "All too often I'm reading this great book with a solid setting, characters that walk right into my own life, then somewhere around the fifth or sixth chapter the plot kicks in – and all that falls into the background. I want all that stuff, that surround, to remain in the foreground." 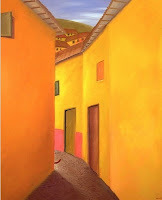 This short story of mine is today's read over at Every Day Fiction. My thanks to everyone who finds time to read, rate and/or comment. I spent the day in London but managed to edit a short crime story AND the final section of the novel during train journeys and pit-stops. I went shopping for books (at Hatchards, the bliss! )and came back with a Fifty Anniversary edition of Tom's Midnight Garden which I'm going to read to Milly at bedtime, plus Sol Stein's Solutions for Novelists and Stephen King's On Writing, because these are books I've been meaning to read for a while. 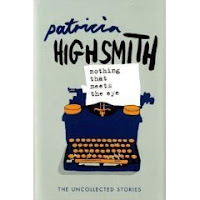 The book I'm most excited about is Patricia Highmith's Nothing that meets the eye, a collection of 'uncollected stories' with her signature, unsettling themes. 'Delicious poison' promises the review on the back. Yum. Plus, look at that lovely cover. I couldn't resist posting this image, partly because it reminds me any number of gothic fiction book covers from the Victorian era. Or "The Nightmare", by Johann Heinrich Füssli. Hold the sauce, anyone? This short "screenplay" of mine is currently showing over at Red Peter. You may prefer to open the link in the privacy of your own room. Enjoy! This has been around for a while but it's still good stuff. What did your last rejected story die of? I think mine suffered from terminally low Intent Antibodies. Behler's Blog, part 1 & 2. "Fluff is the little inconsequential stuff that, when properly done, can round out a chapter or a character very nicely but has nothing to do with the plot. For example, it’s the quick sidebar to explain that the hopelessly rich Margarita Von Aldenbald was nicknamed Lampie during a inebriated foray into a trucker bar where she commenced to dancing on the tables wearing nothing but a lampshade while singing “I’m An Oscar Meyer Wiener.” It goes to development and adding richness to the story. " I was tagged by the fabulous Shameless. It goes like this. Display the award. Link back to the person who gave you this award. Nominate at least 7 other blogs. 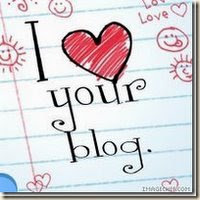 Put links to those blogs on your blog. Leave a message on the blogs of the people you've nominated. You can only answer in one word. I tag Avis, Robin, Tania, Maria, Nik, KC and Douglas. Apologies to those already tagged. And tagging doesn't obligate anyone to anything. Just so you know. That was fun, thanks, Kev. Now back to that novel. My debut at this venue! It's a very short story about a malcontent werewolf. It's also an entry in their annual contest but there's some fearsome competition so I don't expect a prize. It looks as if my mother will be given the all-clear to return home after cancer surgery ten days ago. She's had a rotten time of it despite the operation being a success (as far as we know at this stage), but I'm hoping she's turned a corner at last. Adding to the stresses of last week, I've been wrestling with the revisions to the novel. Thanks to the input from the agent I know what's right and wrong with it but the more I edit, the more it slips away from me. That's how it felt. So yesterday I started writing a new end scene, entirely new. I was writing, not editing, not shuffling scenes around in the hope they'd fall out the right way. Of course now it seems so obvious: I needed to WRITE my way out of the mess. I'm sparky with ideas for how to fix it. Oh and I love my heroine (and hero) all over again. I know there are people who enjoy the discipline of editing but for my money you can't beat writing. I feel I'm flexing all the right muscles after months of trying to fit myself in a cramped space and sit tight. The latest issue of The Short Review, edited by Tania Hershman, contains my review of Chavisa Woods' first collection, Love does not make me gentle or kind, plus an interview with the author. Also reviewed is Neil Gaiman's M is for Magic, which I'm thinking of buying for my daughter, and Tiny Deaths by Robert Shearman, which I'm thinking of buying for myself. So much wonderful reading to be done. In the aftermath of the Fish cull (see previous post), I've been thinking about the value of entering writing contests. Is a writer a gullible fool to fork out entry fees and should we eschew contests who charge them? Or is the very process of entering (and losing) contests a necessary part of our craft? I think a serious writer needs a strategy. I spent my childhood years scribbling snippets of stories for friends and family. Lovely pastime! My readers told me I was brilliant; I basked in their unqualified praise. Then I grew up. I learned there are no short-cuts to getting published. That you have to work damn hard at it, and you have to have a strategy. You have to court criticism, and failure. Success, I've concluded, is measured in your ability to accept failure and keep moving forward. I'd go further, in fact. Failure is your friend. It gives you a line in the sand, a measure against which to work. You might think that a hundred failed entries, or failed submissions, would equate to a feeling that you're unequal to the task you've set yourself. But the writers who give up, in my experience, are not the ones with a hundred rejection slips under their belts. They're the ones with one or two rejections or maybe none - because they didn't ever work up the courage to put their writing out there to be judged. Perhaps they told themselves it was pointless because contests are a rip off and a crap shoot. Funnily enough it's often not a lack of confidence that stops a writer subbing their work. It's ego. "Of course they'd never award a prize to such innovative writing." A serious writer knows the value of failure, is intimately acquainted with its sharp edges and its blunt tone. Remember Peter O'Toole in Lawrence of Arabia, holding that burning match until it's ash between his fingers? "Of course it hurts. The trick is not minding that it hurts." About this strategy business, then. So few magazines pay money and even fewer have a profile with agents, publishers, editors - all the people you need to get onside if you want to make a living as a writer. Sure there are bound to be contests out there which operate as commercial ventures but these are generally easy to spot. Having been close to Fish in Bantry this year I can tell you that it's a labour of love for the people behind the venture. It cost me about ten pounds to enter but the prize money was close to six hundred pounds - I call that a good return for my investment. More importantly, it got me right in front of readers, learning important lessons about the hard end of the business. I got quizzed at length by a scouting agent, face-to-face. I'm trying hard to think how else I could secure that sort of exposure if I eschewed all contests on the grounds that I was getting ripped off. I'm under no illusions; I'm a grown up. Fish was a calculated investment. And even had I got nowhere I'd have counted it valuable in the sense that unless we keep putting our heads above the parapet, keep courting the slings and arrows, how will we know we're getting anywhere? It takes nerves of steel to keep pushing our work out there to be judged, to be rejected. But without that process I think the danger is this becomes an exercise in ego-stroking. There is an acid test in the judgement of peers and professionals. Sure it's a crap shoot, to an extent. A lot of it comes down to subjective opinion of an individual or two. And luck. But I'd be interested to hear people's thoughts on how else we can get ahead, get better, stronger. Persuade me! 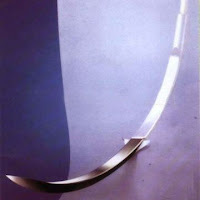 This just in from Fish Publishing - they've cancelled the Fish Knife Award for 2009 due to lack of entries. I was so excited about entering this for the first time, and worked hard to get my story good enough. Damn. Now I have to find a new venue. All suggestions welcome - it's a crime short story. I hope this doesn't mean Fish is going to dump other categories. I do understand their reasoning - they have to protect a certain standard if the winners are to feel they've achieved something - but all the same. Damn. ETA: They've just cancelled the Criminally Short Histories Award, for the same reason. That's the category I won last year, and for which I'd entered several pieces this year. Double damn. The new issue of Smokelong Quarterly is now published, and carries my story and interview plus the lovely illustration by Venetia Sarll. I'd be glad of all readers - thank you!